Can I still ask Santa for something special? All I want for Christmas is an oven mitt, or even a nice pot holder. Pans crash, cats scatter under my gaze of fury, dogs jump up, kids and John come running as a stream of language that probably landed me on the naughty list for good runs out of me as I cool my burned thumb under running water. … have eaten holes in the thumbs of all our oven mitts. Holes that make it seem like you should still be able to use the oven mitt – but you shouldn’t, you really, really shouldn’t. Unfortunately after I burned my thumb and our kids’ ears, I doubt Santa is going to deliver. But I wonder… do you think he’d trade for a cat? My brother Tyler is going to demonstrate how to properly eat a prick-headed monkey. But first a few prick-headed monkey facts. -First off, nobody knows why they are called that. They are three cornered pies filled with currents and citron, there are absolutely no monkeys involved. -Second, nobody in our family that isn’t a direct blood decedent of Gramps actually likes these. There are those that will eat them, but nobody else loves them. -Third, those of us who love them really love them. -Fourth, we only make them at Christmas time. The first thing to do when eating a prick-headed moneky is to find other prick-headed monkey lovers to eat one with you. Three people is the optimal number though two works as well. This is important because the first key to proper prick-headed monkey consumption is to con someone else into cutting it. I divide and you decide has never been more important than in prick-headed monkey division. The pies are nominally triangular in shape and must always be divided into three pieces (I don’t know, it’s tradition, just go with it okay?). In this instance my mom divided, now she’s pretty good at prick-headed monkey division ( This is a skill, you try dividing a lumpy triangle into three equal parts, it’s not as easy as it seems.) but there was still a large piece. Tyler and I thumb wrestled for it. My brother has thumbs like a gorilla- he won. You can see him here with his rightfully gained largest piece. This is of course exactly why you want three people to eat it with. Tyler would have had no fun gloating over the largest piece without the other two of us there. This is also the time to take pictures to send to those family members who aren’t able to join in the feast so that you can hold it over their head that you are eating fresh out of the oven prick-headed monkeys and they are not. Sorry Uncle Jim, we know you are recovering from heart surgery and that’s why you couldn’t be around but there is actually no one else in the world who would want to eat these so these pictures were for you. Notice how Tyler is gazing fondly at his biggest piece before he takes a bite. In the following picture you can see how Tyler is clearly enjoying his own piece while at the same time mocking ours. Because dough balls. If the person who made the prick-headed monkey did a good job the filling will be all the way to the corner. If not, the corner will be nothing but a dough ball. To finish off the proper way to consume a prick-headed monkey you must stay on alert for dough balls in the corners. Then, if you made them, you should deny their existence and attempt to prove that you had a current in the very furthest corner of your piece. If someone else made them however it’s best to claim that your corner was nothing but a dough ball and completely terrible. Even with a dough ball there are those of us who know that prick-headed monkeys are never terrible and, like Tyler in the picture above, we are already plotting our next piece. Normally I steer clear of controversial topics but occasionally there are times (like the great macaroni debate) when I’m willing to broach a touchy subject. Photo taken for Mundane Monday with Trablogger! Cookies for our capoeira groups fundraiser. …and sometimes I decorate cookies. At this moment in time I think it’s quite possible that Jane is too honest for her own good. I was making a chocolate cake for a friend’s birthday when Jane piped up, ” I help you?” Fellow chocoholic that I am, I knew that “help” did not in this instance mean that she wanted to actually help. But rather, “Hey mom I’d like to sit on that stool and eat all the chocolate that you’ll let me.” Sympathetic to her plea, I set her up on a stool and gave her a frosting beater to lick. But soon she was eyeing what I was doing. I’m not going to lie, what I was doing was both interesting and delicious. I was in the final stages of assembling the Chocolate Quake Cake from Sprinkle Bakes. After baking the cake and making the frosting, you’ll have used three(!) full cups of cocoa powder. In making the chocolatey wonder, first you stack and frost two layers like any normal cake but then a third layer is cut up into random chunks and stuck it all over the entire thing. Sounds crazy, tastes awesome. I highly recommend it! But, back to the kitchen. Jane’s stool is at the counter, just out of reach of the stove where I am working. (Not a coincidence.) 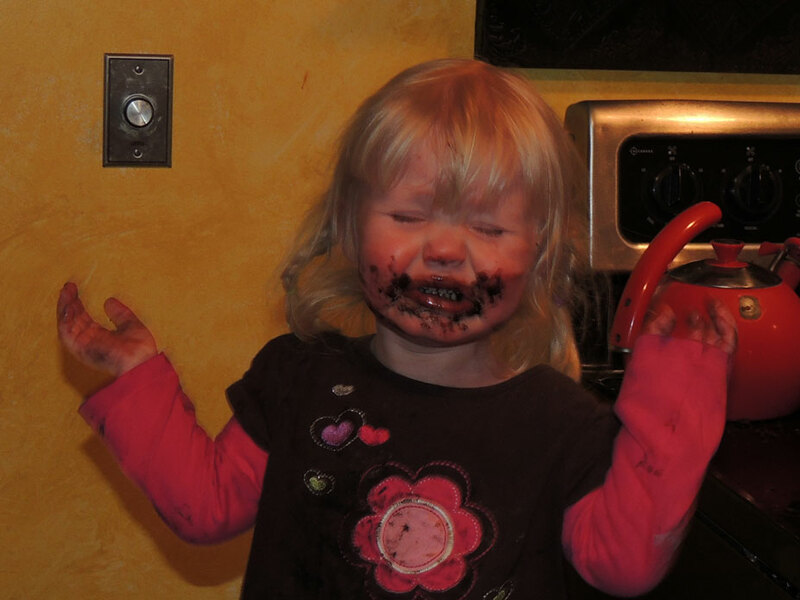 Jane turns her chocolate covered face and sees the giant pile of cake chunks I’ve made, drops her frosting beater and asks if I’ll scoot her stool closer. Now I know all she wants is to get within arms reach of the pile of cake chunks which I’ve already started sticking on the cake as fast as I can. But I ask anyway. “Jane are you going to snitch my cake if I scoot you closer?” And she, honest girl that she is, says “YEAH!” and I explain (still frantically sticking on pieces) that this cake is for our friend and we can’t eat it yet because we are going to give it to her for her birthday. But if she can just lick her frosting beater and hold on, perhaps I’ll have a few leftovers at the end. Jane is two. This schpeal of mine results in nothing but the full on hysterical cry of the deprived child – for at least five seconds – before she sniffs, sobers and asks politely if I’ll move her stool closer. “If I move your stool closer what will you do?” “EAT CAKE!” Again, we go through it, nope, can’t eat this cake, short hysterical crying, sobering, sniffles, polite asking. “Sure, I’ll move your stool but you can’t touch the cake.” “I NEED CAKE!” And while I completely understand the sentiment, I repeated that we couldn’t eat this cake – yet. Again with the crying. Again the polite asking. Again the refusal. And again, and again. Let me tell you, I have made this cake before and I don’t remember it taking near so long to stick all those little chunks on top last time. Eventually, I covered the cake, we called in the sisters, had a mini chocolate cake feast with the leftovers and life was good. You know, I appreciate her honesty, I love that she asks politely even in the middle of a tantrum and I hope she keeps those wonderful qualities for life. But I just gotta think it would have been easier on us both had she just snitched a piece of cake without saying anything. 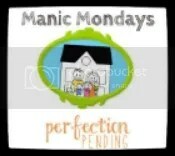 Today I’m linking up with Manic Mondays where Perfection Pending and others share parenting stories. Not to complain, of course, but to share the crazy!